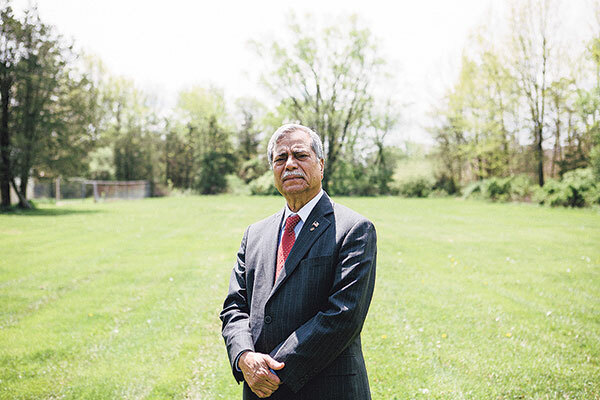 M. Ali Chaudry, president of the Islamic Society of Basking Ridge, stands on the grounds of the proposed mosque in Bernards Township. A multi-religious coalition of 34 groups founded by the Anti-Defamation League is rushing to the legal defense of the Islamic Society of Basking Ridge, which is seeking to build a mosque in Bernards Township. Acting on the premise that “a Muslim mosque cannot be subjected to a different land-use approval process than a Christian church simply because local protesters oppose the mosque,” the Interfaith Coalition on Mosques filed suit in New Jersey’s Federal District Court May 11. Their friend-of-the-court brief argues that the township’s planning board “improperly applied different legal standards to a mosque simply because it is a mosque” when it unanimously denied the Islamic Society’s application to build a 4,250-square-foot house of worship on Church Street, a historic section of the township, on Dec. 10, 2015. The coalition challenging the board’s action includes the ADL, the American Association of Jewish Lawyers and Jurists, the Union for Reform Judaism, Women for Reform Judaism, National Council of Jewish Women, and the Central Conference of American Rabbis. Among other groups involved in the legal action are the Baptist Joint Committee for Religious Liberty, the Becket Fund for Religious Liberty, the Center for Islam and Religious Freedom, Ethics and Religious Liberty Commission of the Southern Baptist Convention, the International Society for Krishna Consciousness, Muslim Bar Association of New York, National Asian Pacific American Bar Association, National Association of Evangelicals, the Sikh American Legal Defense and Education Fund, the South Asian Bar Association of New Jersey, South Asian Bar Association of New York, the Unitarian Universalist Legislative Ministry of NJ, and the American Civil Liberties Union. 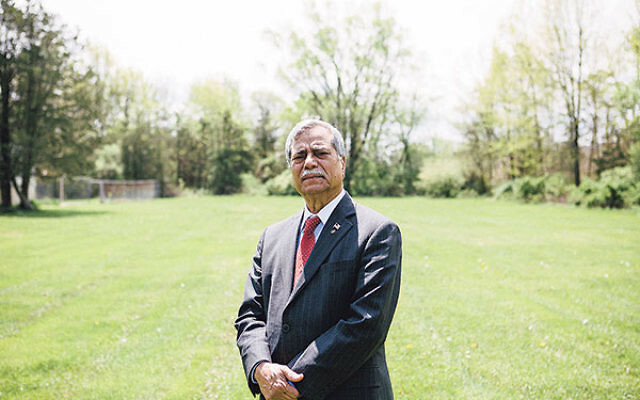 At the center of the storm is M. Ali Chaudry, a Pakistani-born Muslim who is a former mayor of Basking Ridge and is president of the Islamic Society. “This is an issue of fairness,” said Joshua Cohen, NJ ADL regional director. The ISBR “is being held to a different standard than any other house of worship in the community. That is reprehensible. We wouldn’t stand for it if it was the Jewish community. We wouldn’t stand for it if it was the Christian community. And we wouldn’t stand for it if it was the Hindu community. “The town is using a discriminatory action in its denial of the Muslim community’s right to construct a mosque,” he told NJJN in a May 12 phone interview. The Islamic Society’s plan is to build a mosque for 150 worshippers. But after 39 public hearings in a four-year period, the planning board denied its application, saying the mosque needed to provide 107 parking spaces — more than double the 50 spaces required for other houses of worship in the township. The board also said the mosque’s design lacked “a satisfactory buffer” between the project and residential properties, as well as an inadequate drainage basin and insufficient access for fire and emergency vehicles. Chaudry promised he would split the mosque’s Friday afternoon services into two sessions so that the 65 attendees would have adequate parking spaces, and he pledged that the mosque would comply with the occupancy limits established by the township’s fire code and fire officials. Underpinning the mosque supporters’ argument is the Religious Land Use and Institutionalized Persons Act of 2000, a federal civil rights statute designed to provide “heightened protection” for the free exercise of religion — particularly in the area of land-use regulation. A group opposed to the mosque’s construction, the Bernards Township Citizens for Responsible Development, did not respond to NJJN’s request for an interview.